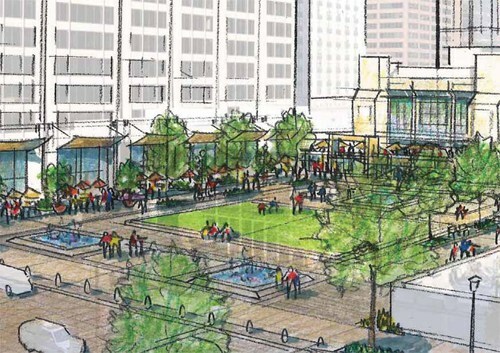 A new open space plan for the future of Baltimore’s downtown was just released that focuses on creating a network of open spaces throughout the city's core. The plan showcases the role that BIDs can have in supporting Placemaking: led by Downtown Partnership of Baltimore (DPoB), the plan includes improvements for a large, 125 block area of the city’s downtown core and was developed through a series of workshops and online engagement that PPS directed in partnership with the project's lead, local landscape architecture firm Mahan Rykiel. ‍The new Open-Space Master Plan, led by the Downtown Partnership of Baltimore, proposes a network of destinations throughout the city's downtown. 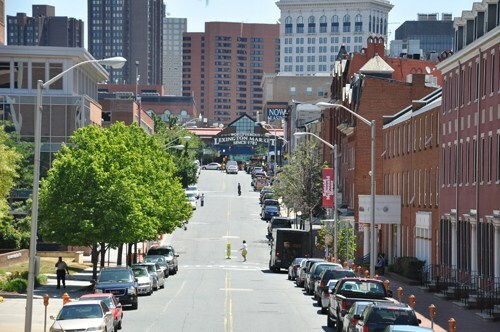 The Downtown Partnership of Baltimore has also committed to providing $1.5-1.8M each year to continue the Placemaking efforts outlined in the plan. Through taking a proactive role in creating more quality public spaces and engaging the community broadly, the DBoP is expanding the traditionally narrow role of BID’s as organizations confined to mitigating security and maintenance issues. The master planning process has led to a new vision for the future of Baltimore which the plan defines as “walkable...vibrant and dense, with day-time and night-time activities- an energetic street-level experience for pedestrians, and engaging and pleasant open spaces.” Many of the ideas emphasized in the report are low-cost interventions that could be implemented this year. PPS partnered with with lead designer Mahan Rykiel as well as Sabra, Wang & Associates and Flannigan Consulting. 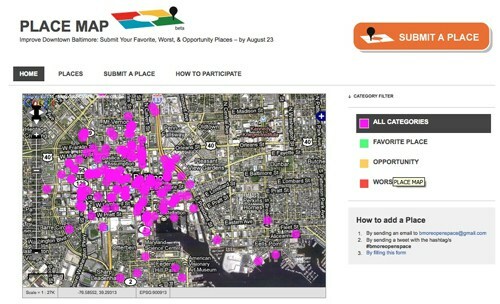 During the summer of 2010, PPS ran three public workshops to evaluate 5 key opportunity places and develop a short and long-term vision that are the center piece of the Open Space Plan.To complement the PPS-led Placemaking workshops, PPS also implemented its first beta test of a new form of digital engagement: the Place Map, a civic crowdsoursing tool and approach through which citizens identify places in their city that matter most— an online version of PPS’ proven Power of 10 Placemaking activity. The use of the Place Map broadened community involvement in the master planning process by collecting information from more participants about a higher number of locations with less time and lower cost than non-digital means allow. ‍‍The PlaceMap, an online civic crowdsourcing tool and approach through which citizens identify places in their city that matter most. Enhancing the network of open spaces in Baltimore is only one part of a new vision for the city’s future growth, which will also include multi-use destinations anchored around fresh, local food. Today, PPS’ Markets team visits Baltimore to focus on the creation of a "healthy food hub" in the Northeast Market that builds on PPS' 2005 work there. The Northeast Market can serve as a model for Baltimore's other food market halls to become as anchors to healthy food systems and vital communities.We hope this is the start of a campaign in Baltimore to capitalize on local talents and build on the great assets of Baltimore to build the city around places.